LAS CRUCES, N.M. — Representatives from the three different companies chosen by NASA to develop private space taxis to carry astronauts to orbit say their vehicles are making substantial progress toward launching people into orbit within the next few years. The companies — Space Exploration Technologies Corp. (SpaceX), The Boeing Company, and Sierra Nevada Corp. — are competing to fill the gap left by NASA's retired space shuttles for the launching of cargo and crews to the International Space Station. Each private space taxi firm has received funding from NASA under the Commercial Crew integrated Capability program (CCiCap) to complete a series of development milestones with the goal of taking over transportation to low-Earth orbit from the Russians. "We're going great guns, we're working very hard, and we hope to have people flying very soon inside the Dragon," SpaceX's commercial crew project manager Garrett Reisman said Wednesday (Oct. 17) here at the International Symposium for Personal and Commercial Spaceflight. Boeing's CST-100 space capsule falls to Earth in a successful parachute drop test held April 3, 2012, at the Delamar Dry Lake Bed near Alamo, Nev.
SpaceX's Dragon space capsule has already made two unmanned flights to the International Space Station this year under NASA's cargo delivery program. Work now is focused on outfitting the capsule to carry up to seven people by adding a launch abort capability and life support system, as well as designing spacesuits and the crew cabin layout. 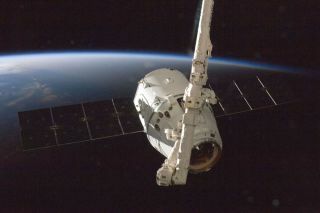 The vehicle, which launches on SpaceX's Falcon 9 rocket, could make its first crewed test flights in mid-2015, Reisman said. "The real focus here is getting the final design and implementing a system that is safe, reliable and affordable," John Mulholland, vice president of commercial programs in Boeing's Space Exploration department, said today (Oct. 18). The company just recently completed a preliminary design milestone called integrated systems review, and plans to set the vehicle's final design plans with a critical design review in April 2014. That should pave the way for the first people to fly on CST-100 in 2016, Mulholland said. Sierra Nevada's entry into this new space race is called the Dream Chaser, and differs form the Dragon and CST-100 cone-shaped capsules in its winged space plane design. Dream Chaser, too, will carry a crew of seven and launch on the Atlas 5, and is targeting a first manned launch in 2016 or 2017. Its goals for the near future are furthering the vehicle's design and performing preliminary test flights. "When I first started looking at building a vehicle for this marketplace, people basically laughed," said Mark Sirangelo, corporate vice president of Sierra Nevada's Space Systems. "People kept constantly saying, 'It can't be done, it can't be done.' We believe it not only can be done, it is being done. We really are on the verge of moving this whole industry form theory to practice." While all three companies are initially developing their spacecraft to serve NASA, they intend eventually to carry a wide range of passengers, including space tourists, scientists and astronauts from countries without their own launch vehicles. "Once we have this thing up and running for NASA we are free to use it for other purposes," Reisman said. "It does bring up a bunch of interesting possibilities. But this is all after we accomplish our primary job, which is getting Americans back into space on American vehicles."